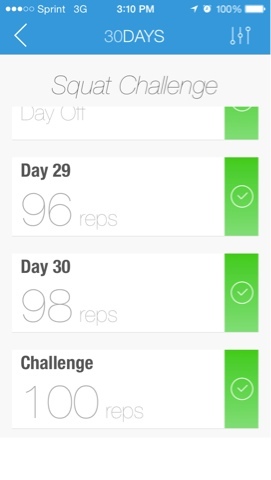 I used to think those 30-Day Fitness Challenges (unless they were for prizes, which I don't count) were not for me because I found out about them from blogs of people who already work out pretty much daily and were trying to find additional reasons to exercise or go on some kind of diet. However, as someone trying to get back into the habit of exercising, the idea was really appealing. This way, even on the days when I didn't make time for a proper workout, there would still be something to work toward, something to break up my sedentary state. I chose a 30-Day Squat Challenge for a couple of reasons. First, it popped up on my Facebook feed from one of my connections. Second, my legs have definitely lost a lot of muscle tone, and since those are some of the largest muscle groups of the body, I figured it would be the most bang for my buck. Finally, squats are pretty easy to do anywhere and can even be done while carrying the little one. There are many squat programs online, and some of them max out at 250 squats. The thought of that many reps made my head spin, so I modified the program to max out at 100. I used this app to tell me what my daily squat count should be and to remind me to do my set for the day. I had to tinker with it a bit so that I was doing 100 by the end of the month, because it pretty much sets the month based on how many you could "initially" do (I put 50, which seemed reasonable). Technically, you don't have to do them all at once, but it was way easier to just get them done at once. I started on June 1, and now that the month is over, I can definitely say I've gained a lot of strength back in my lower body! My running (or what little I do) and Insanity-doing is getting much more do-able, too. From a vanity standpoint, although my legs definitely aren't where they have been and were kind of getting out of hand from all my inactivity before, they do seem to have toned up a bit, as well. So, will there be other fitness challenges? I have a couple of considerations, so we'll just have to see! Great job! I'm glad things are going well fitness-wise. It feels great to make strides.